A funeral Mass for Sister Jovita Chierek was celebrated Feb. 21 in the Lally Room on the Cardinal Carberry Campus of Cardinal Ritter Senior Services in Shrewsbury. Sister Jovita, a Franciscan Sister of Our Lady of Perpetual Help for 81 years, died Feb. 16 at Mary Queen and Mother Center on the Cardinal Ritter Senior Services campus. She was 98. Born in St. Louis, she entered the Franciscan Sisters of Our Lady of Perpetual Help in 1935 and professed perpetual vows in 1942. She earned a bachelor’s degree from Webster College in Webster Groves. 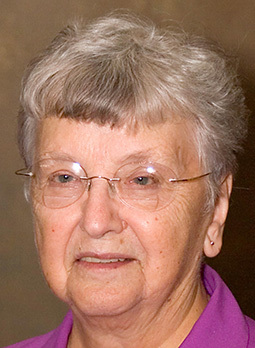 Sister Jovita taught in the St. Louis Archdiocese at Holy Ghost School in Berkeley and Our Lady of Guadalupe in Ferguson and was a teacher aide at St. Sebastian School in Dellwood. She was both teacher and principal at St. Francis of Assisi School in Oakville. She also taught at schools in Illinois, Louisiana, West Virginia, Ohio, Texas and Wisconsin. In her later years she volunteered at Villa St. Joseph Child Care Center, St. Sebastian Parish and a number of southern Illinois parishes.